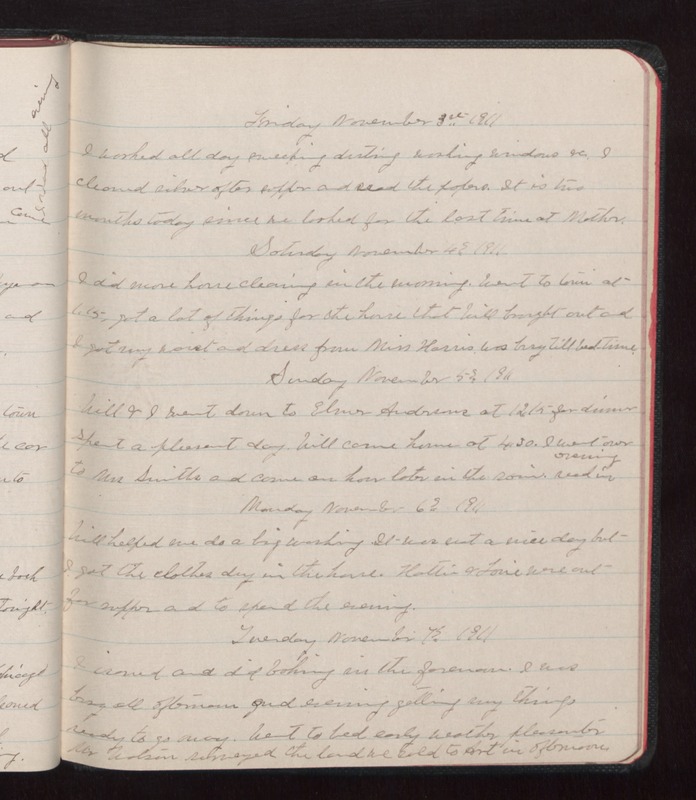 Friday November 3 1911 I worked all day sweeping dusting washing windows etc. I cleaned silver after supper and read the papers. It is two months today since we looked for the last time at Mother. Saturday November 4, 1911 I did more housecleaning in the morning. Went to town at 1.15, got a lot of things for the house that Will brought out and i got my waist and dress from Miss Harris Was busy till bed time. Sunday November 5 1911 Will & I went down to Elmer Andresons at 12.15 for dinner. Spent a pleasant day. Will came home at 4.30. I went over to Mrs Smiths and came an hour later in the rain. read in evening. Monday November 6 1911 Will helped me do a big washing. It was not a nice day but I got the clothes dry in the house. Hattie & [Lorie?] were out for supper and to spend the evening. Tuesday November 7 1911 I ironed and did baking in the forenoon. I was busy all afternoon and evening getting my things ready to go away. Went to bed early weather pleasanter. Mr. Wilson surveyed the land we sold to Art in afternoon.